Inside This Easy To Follow 5 Lesson Course by Email, You Will Be Introduced To The Power Of Tumblr & How You Can Use To Your Advantage! Inside Each Lesson, you will learn the basic information that you need to know so that you can discover exactly what Tumblr is and how you can harness the power of this massive social blogging network for yourself! You'll have access to easy to understand information that will show you how and why you should consider using Tumblr to post your content and even promote your products and services. Inside each lesson, you will be introduced to the different aspects of the Tumblr network, so that you can develop a better understanding of how it functions and how you can take full advantage of everything it has to offer! 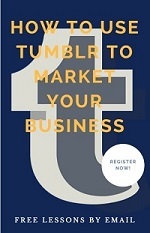 Register to get our 5 email lessons for, "How to Use Tumblr to Market Your Business". You will receive one email per day walking your step-by-step through setting up and getting the most from your Tumblr account. Success! Thank you for registering for my free by email course, "How to Use Tumblr to Market Your Business". Check your email to confirm your subscription. Then watch your email for your lessons. Enjoy!